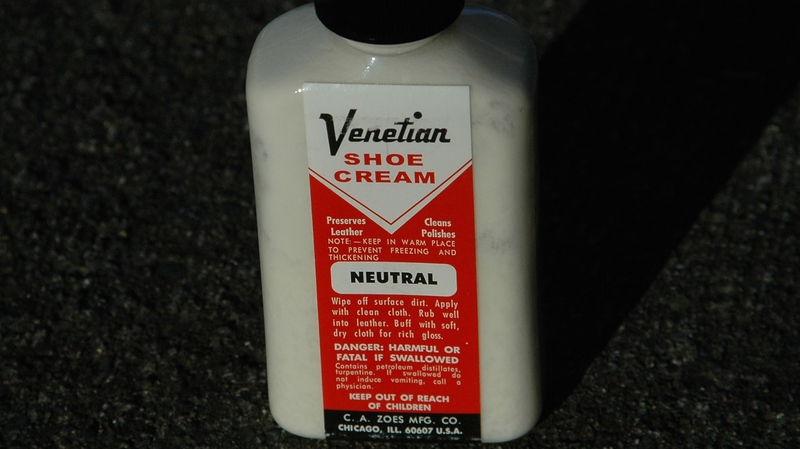 Short story: wipe the shoes with a damp cloth, follow with Venetian Shoe Cream and buff with a soft, cotton cloth. I have tried a number of methods and I have found this to have the best results. 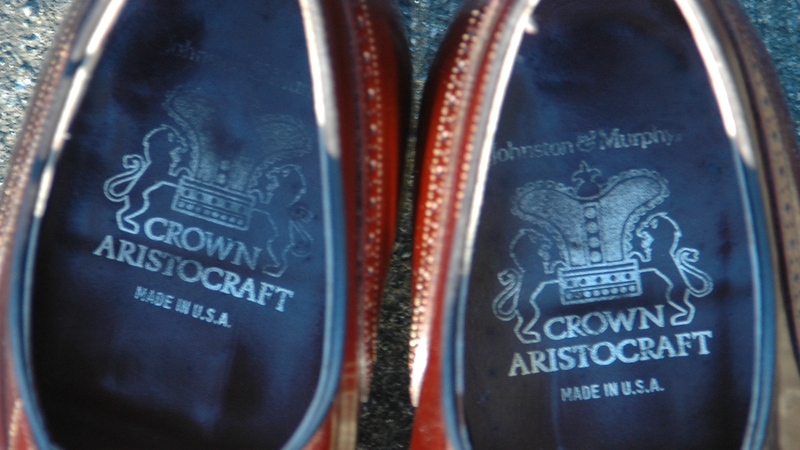 The longer story is about my search for a pair Crown Aristocraft wingtip shoes. Crown Aristocraft have been Johnston & Murphy’s top production shoe line for decades and their last “Made in USA” model. They are somewhat uncommon on eBay but not rare. They are also somewhat unloved since their average eBay resell price is only $58. But I wanted a pair in my size and finally found ones for sale. I have had some experience with higher quality corrected grain shoes. 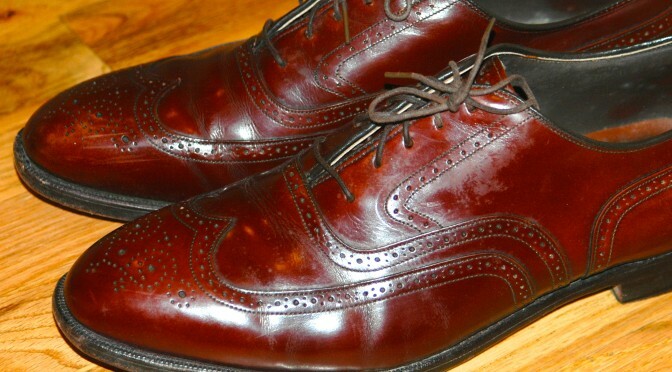 I once owned a pair of Allen Edmonds MacNeil 9147 in “polished cobbler” burgundy. The MacNeils developed minor creases but never flaked and in general, looked good. 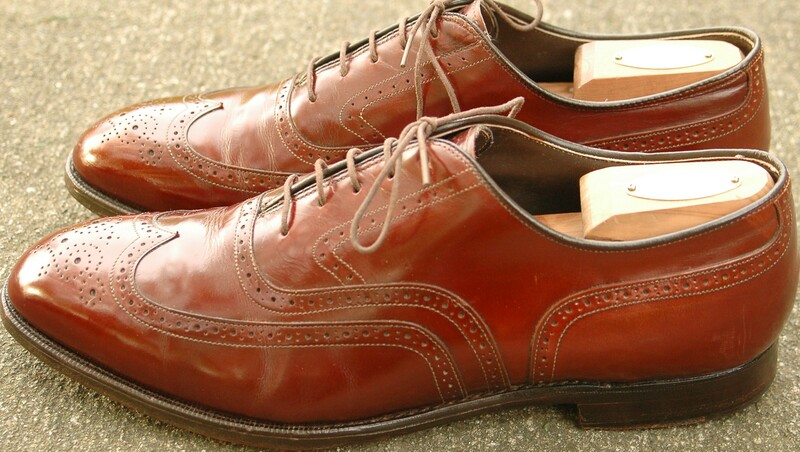 While I had them, I learned that they were impervious to leather conditioners, polishes and waxes that you might put on calfskin. 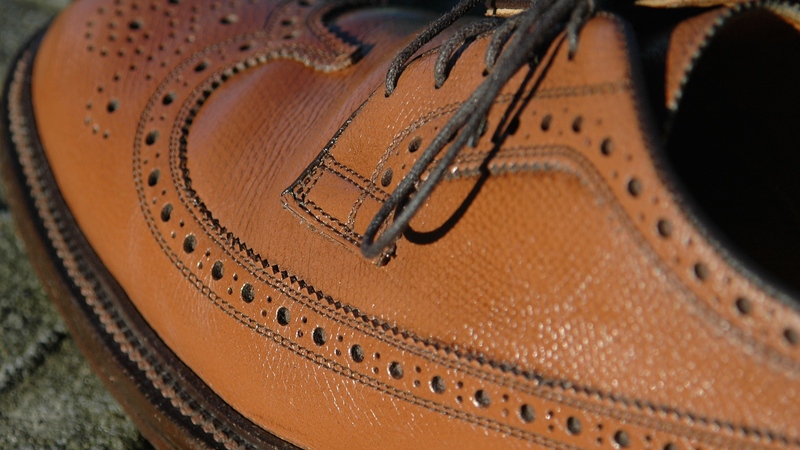 Any applied product could be rubbed off the acrylic finish of the leather. But since shoe care products could be rubbed off, so could dirt and grit with just a damp towel. They were very easy to maintain. After some trial and errors, I found Venetian Shoe Cream (VSC) would get off the gunk that water couldn’t. 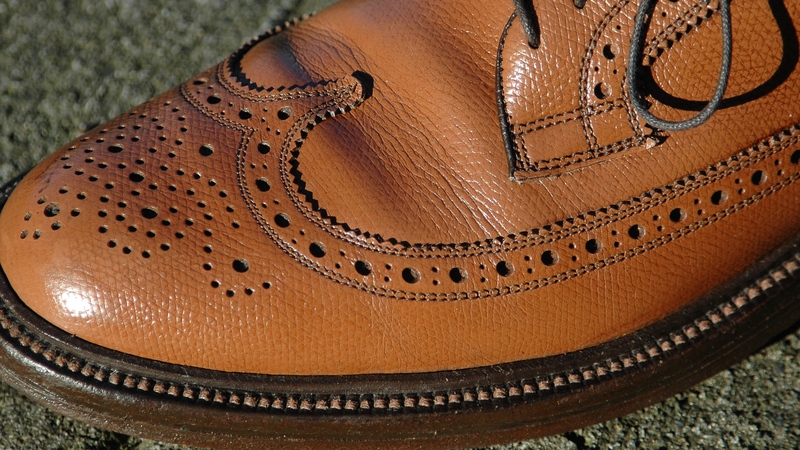 VSC contains turpentine and I believe that removes non-water soluble grime from the shoe surface. 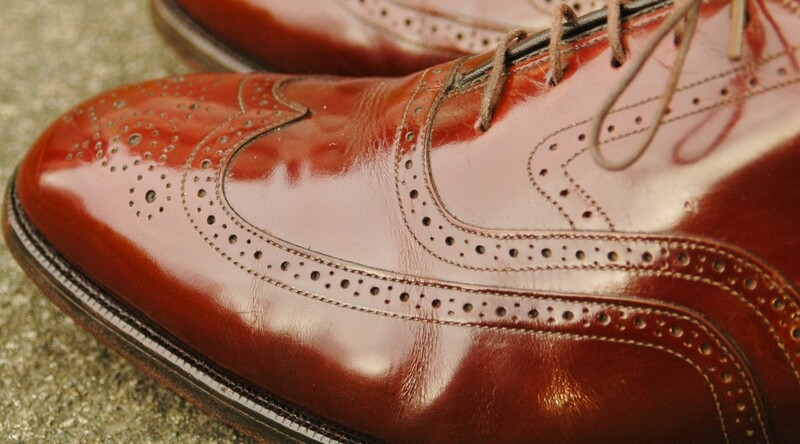 It also gave the leather a higher shine. Corrected grain issues aside, the shoes are well made and they fit well. I am guessing these shoes are 10 to 20 years old based on the logo. Looking online, Johnston and Murphy doesn’t make this shoe in this leather anymore. I am still not sure I like them. They have a bit too much bling. They have been sitting in my closet for a few months. That’s not a good sign. One more thing to note about corrected grain is that it isn’t always a smooth, shiny leather. 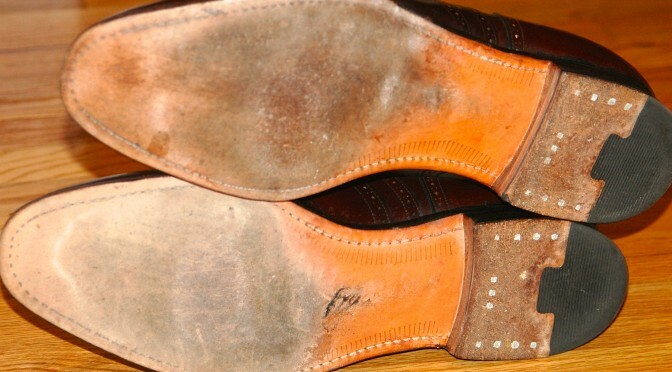 I bought a pair of vintage Nettleton shoes years ago that have a corrected pebble grain finish. 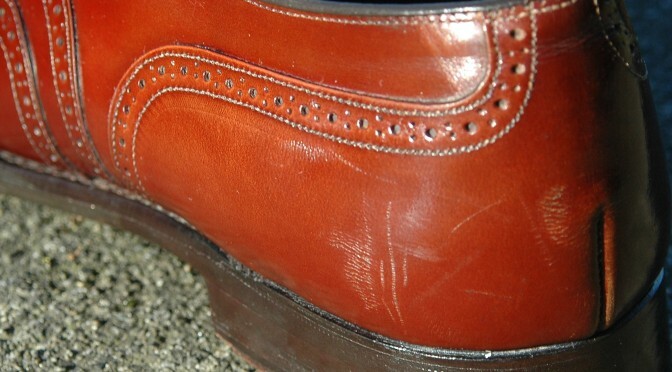 They perplexed me at first because normal calfskin polishes didn’t work on them. The color was also strangely consistent. But the shoes have been great and are sort of indestructible. The leather hasn’t creased much and they resist scrapes and water well. I wear them very regularly. See photos of them below. Hope you found this post interesting. I am not recommending you buy corrected grain leather but in case you have pair (or two (like me)), care for them is pretty easy. Still like the blog. It is regularly useful. and they turned out to be corrected grain (not as I’d hoped). But they look pretty nice and are a good color. 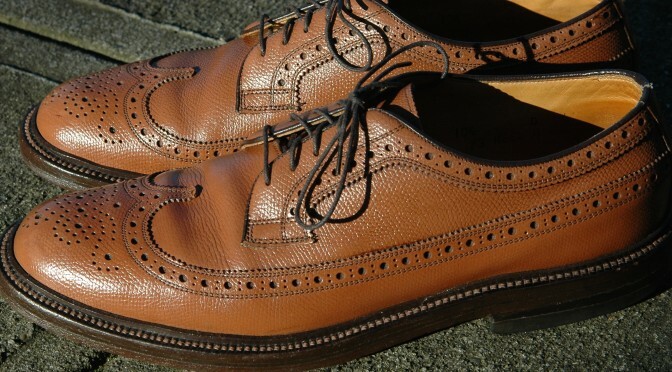 Any idea how these would fit compared to the #8 cordovan longwings (93605 or 97626)? I’ve read that they are TTS but my CG pair feel a bit tight (and I am usually a bang on 10D with the usual lasts). Thank you for catching the grain typo. I have corrected the post. I don’t have any experience with that model so I can’t comment on sizing. I know Florsheim had different lasts but I haven’t seen any information as to which last goes with what model. 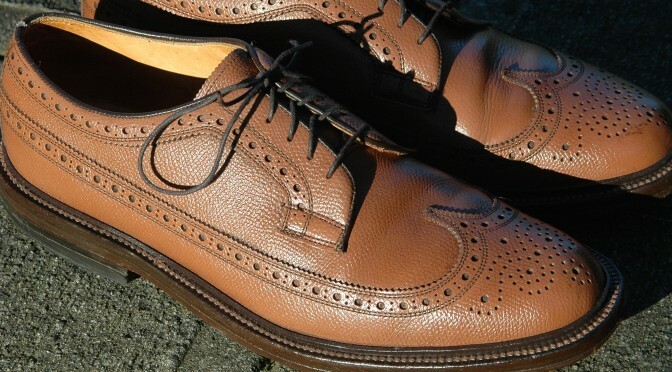 I will publish soon a list of shell cordovan Florsheim models. With pictures. It can be hard distinguishing shell from non-shell especially with NOS shoes. I own a pair of black CG MacNeils. 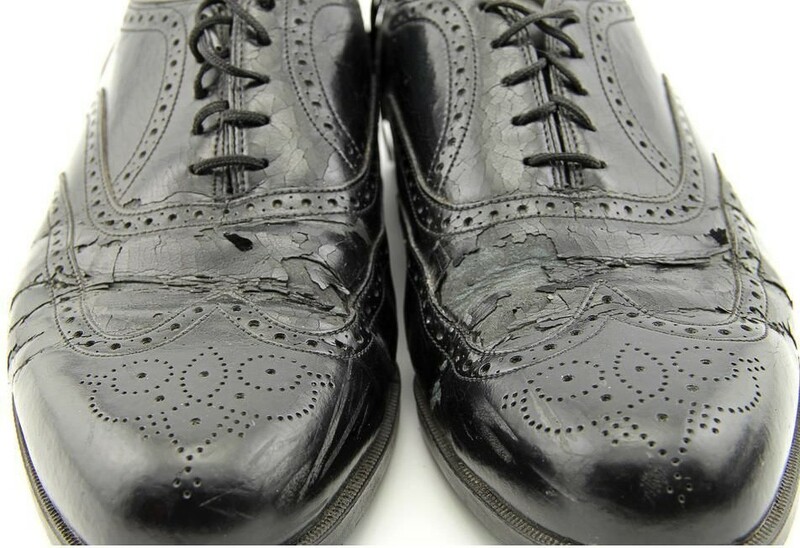 Black, shiny, pointy toed, double-oak soled. Like a bodyguard crammed into a tux. Perhaps the above mentioned sentence could be amended again, because all CG starts as full grain leather before it is sanded down to top grain. The source of poor CG is poor full grain leather. This is a great balanced look at corrected grain leather. Nothing worse than getting excited about a great fined to find out when they arrive that they are CG. 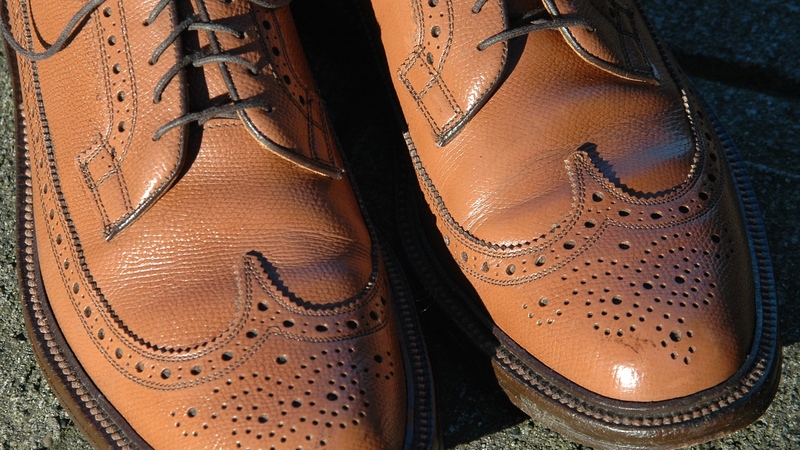 Do you happen to know if any of the Florsheim Imperial used corrected grain? I have my eye on a pair of NOS made in the USA but the leather looks a lot like CG to me.